All the cat lovers will scream… Meow! I want Shupette for Christmas! Aww so much love for the kitty and also their new make collection. Here you go… for the 2014 holiday collection, Shupette by Karl Lagerfeld for Shu Uemura, the snow white long haired pussycat princess mademoiselle Choupette, a.k.a. “Shupette”, the most spoiled feline of celebrated fashion designer Karl Lagerfeld. It has 8 eye shadows and 6 lip color comes with 1 eye applicator tip and lip brush. Purr-fect cheeks! the marshmallow-like texture is powdery and creamy that will gives you a subtle color with smooth texture like powder yet stays well like cream. Long lasting and smudge proof with a creamy and smooth texture, also good for blend or fill in lashes. Available in Midnight Black with Shupette Blue Pearl and Gala Brown with Pink and Gold Pearl. Yooo! Diamonds are Shupette’s best friend! You will shine like a diamond with these glitter powder, in a set there are Pink, Gold and Platinum glitter powders. It gives 24 hours moisture, lasting formula for a flawless complexion. Fabulous cat nail color in pink champagne gold and diamond twinkles that add a purr-fect festive charm to your nails. 4 portable brushes in an envelope shaped stylish brush case in metallic color, including 1 large face brush in natural hair. Awee… now Shu Uemura’s signature make-up box is also dressed-up for Shupette in sleek silver. Love it! This is a limited edition eye lash curler with Shupette lovely charm. This is WOW! A haute-couture premium eyelash with elegant and Shupette blue crystals, that will transform you into a celebrity or diva instantly. Partially accent lashes with metallic silver highlights and Shupette blue crystals just for you to idolize yourself. 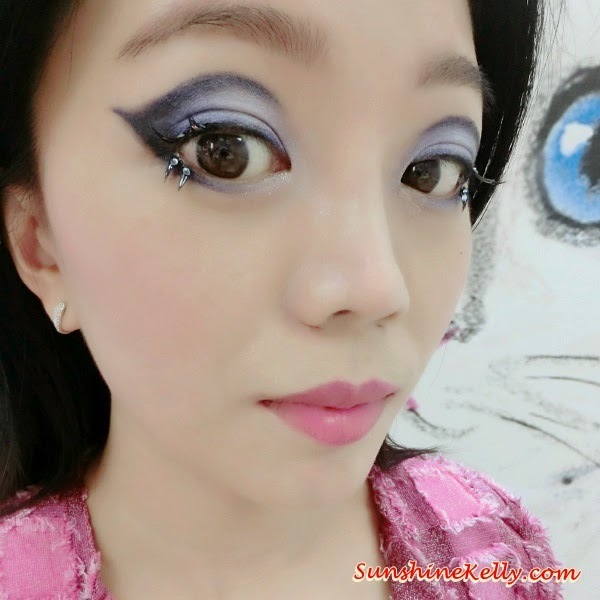 How is my Dramatic & Alluring celebrity cat eye through eye socket shading one side was done by Lisa Yap, Shu Uemura makeup guru and another side I do it myself. I think my eye looks so BIG, love the Shupette Blue (pastel blue) eye shadow. Psst… you can also join the Shu Uemura x Karl Lagerfeld Instagram Contest. All you have to do is post selfie with your most creative cat-eye makeup / cat look / photos of your kitty / both to be eligible to win a Shupette make-up trunk signed by Karl Lagerfeld. Remember to tag @shuuemura_ww and #shucats the contest is until 12th Dec 2014. The collection is indeed beyond cuteness!! I wanted to get the limited edition Eyelash Curler but I heard is sold out within days after the collection was launched. But the Parisienne look really pretty! !